If you were to observe our morning yoga practice, you'd never suspect Sam has a chronic illness and Lauri's left knee was totally rebuilt (see our bio). 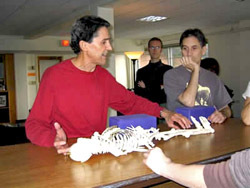 While dealing with issues of recovery and rebuilding and maintaining our own health, we focus our attention on all yoga students, healthy, injured, or ill ... in our quest to better understand how to adapt yoga to maximize health, resolve and minimize the risk of yoga-related injuries, and to increase flexibility, strength and endurance for everyone without pain or strain. The methodology we developed, which often provides dramatic results, are described in our third book, The Mechanics of Yoga. As strange as it may seem, lessons via Skype are amazingly effective. All you need is a computer with audio-visual capability and a high-speed internet connection. Using Sky[pe, we have given private lessons to students throughout the US and in Europe. If you are interested, you may email us for details..